When your serious about drumming, you need a kit to match your ambition. The V-Drums TD-17 series allows your technique to shine through, backed up with training tools to push you further. Combining the TD-50 prismatic sound engine with newly developed pads results in an affordable electronic drum kit that&apos;s authentically close to playing acoustic drums-accurately mirroring the physical movement, stick coordination and hand/foot control that every drummer needs. Meanwhile an array of built in practice and coaching functions will allow you to really focus and hone your technique, measure your progress and increase your overall motivation. Becoming a better drummer is still hard work but the TD-17 can help you get there. The Roland TD-17 module comes equipped with 50 ready to play drum kits that suit any musical style. it also comes with a wide range of training exercises that will encourage skill development and will help to make practice much more fun and productive. In addition it also comes with various coach modes to help improve your time, use the warm up exercises to work through a daily exercise routine, and capture your progress with the on board recorder. The Roland TD-17 can also be paired to your smartphone/tablet via Bluetooth which you can use to wirelessly stream audio and video content to your drum kit so you can play along. The TD-17 also integrates with Melodics for V-Drums, a Windows/Mac software which contains a growing selection of free drum lessons which will really push your playing to the next level focusing on rhythm, timing and muscle memory. The module also allows you to import and edit your own samples so you can really get that dream drum kit sound that you have been thinking of. The Roland TD-17 KV comes with the all new PDX-12 snare pad which features a dual ply mesh head and a large 12-inch that offers better stick control and techniques which are usually only possible with an acoustic kit. The 12 inch dual mesh PDX-12 snare is tension adjustable for authentic and satisfying rebound, while the height of the snare hoop is much closer to that of an acoustic snare drum so you can hit those open rim shots with a natural stick angle. As with all the Roland mesh drum heads the tension can be adjusted so you can have the ideal amount of rebound that fits your playing style. The Roland TD-17 KV also comes with the always incredible CY-5 hi-hat cymbal and the FD-9 foot controller pedal. Advanced triggering, open/close detection and bow/edge sounds all help these brand new kits bring you as close to an acoustic kit feel as you can get. Each of these three kits also come with the KD-10 kick pad which takes over from the previous KD-9, this kick pad allows for expressive foot and pedal technique with even more response and less outward sound. In addition to all this you also get two Roland CY-8 crash cymbals which will act as your crash and ride, and three Roland PDX-8 toms, all of which allow for very expressive and dynamic playing. The Roland TD-17 KV comes with the amazing feature to be able to import and customize all your own samples so you can fine tune your very own perfect drum kit sound. Using the TD-17 KV you can create your own signature sounding kit, layering multiple sounds and editing them using the onboard pitch, EQ, effects and more. Sometimes you hear an amazing drum sound on one of your favorite songs or records or you might be wanting to do a cover of a song and you want to get the drum sound absolutely perfect and with the Roland TD-17 Module you can do just that. Samples can be imported via SD card so you can trigger original single drum samples for each individual part of the kit. You can also trigger audio phrases, sequences and vocal samples. Even better than this you can also mix your imported samples with the TD-17&apos;s built in sounds giving you the ability to make powerful sounding drum kits and virtually any drum sound that you want. 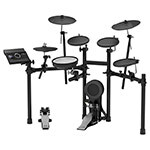 Weather you are just getting to grips with keeping a rhythm or your a veteran drummer looking to refine and hone your technique, the TD-17 module has a number of training features that will help you to naturally grow as a drummer. From warm ups to even tempo and timing and even stamina development, the TD-17 helps keep you motivated, tracks your progress and gives you a score so you can see exactly how well your coming on. With time check mode you can improve your accuracy while playing on with a click track. You get a percentage score for your accuracy and the TD-17 even tells you if your pad strikes were ahead, behind or even on the beat. You can take your timing to the next level by switching over to quiet count mode. the perfect way to refine and hone your internal sense of timing and tempo, the TD-17 will give you a few bars with the click track before cutting out. You continue to play during these silent bars with the aim of staying in time for when the click track returns. The more you use this practice mode the better your &apos;internal metronome&apos; will become. Then there&apos;s warm up mode which makes sure that your daily practice sessions are more fun and motivational. You can choose either a five, ten or fifteen minute session with a range of difficulty settings then set the tempo. You will then be provided with a range of different exercises that will help you work on rhythm changes, tempo changes and playing accuracy. When the warm up session is over you are given a grade based on your overall performance which gives you the motivation to go back and improve on this grade. If you want to take a break from drumming solo, how about playing along to your favorite songs and bands. Play along to your favorite tunes, practice a cover that you will be performing on stage or rehearse your own bands music recording all through the convenience of Bluetooth streaming. Using your Bluetooth enabled media player such as your smartphone, you can stream songs directly to the TD-17 module and play along, listening to the entire performance through your headphones. It&apos;s not always convenient to get your whole band together for a rehearsal but you can carry on playing along with the band by playing your recordings from your smartphone. When you and the band get together for your next rehearsal or for a big show you will be more than prepared. Furthermore, you can record all your playing and listen back to it so you can review your performance and decide if there&apos;s anything that needs improving. The TD-17&apos;s sound engine delivers a superior drumming experience thanks to the Prismatic sound modeling technology that has been inherited from the flagship TD-50&apos;s sound module. Once you start to play you will notice a wider range of dynamics and dramatic tonal changes, depending on where and how hard you strike the pad. From rim shots, flams, rolls and ghost notes on the snare to dramatic crash hits, sustained cymbal swells and half open position of the hi-hat along with different sounds for the bow and edge, every nuance is detailed, accurate and ultra smooth.